2012 was a good year for sailing. 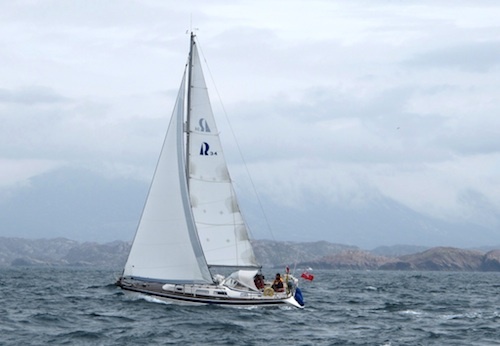 Dawn Treader—our Hallberg Rassey 34—has completed a Round Britain in 76 days having set off from Dartmouth in early May 2012. You can see a map of the whole trip on The Plan page. Detailed statistics for the whole trip are given on the Trip Stats page. You can also find a page showing all of the posts in order of the journey. Serious planning for the trip started in 2010 and from the start its was agreed that we would do the journey in one go. Preparations were made throughout the winter of 2011 and in spring Dawn Treader was ready for a May 5th departure. There would be myself and a long time cruising friend, David Lewis, who would do the whole trip; three other crew members would each join to help with some of the longer legs. I decided to travel clockwise in order to maximize our time on the more interesting West Coast of Scotland. Our route would take us from Dartmouth to Milford Haven in Wales; across to Arklow on the East coast of Ireland; up the Irish and Northern Irish coasts; then across the North Channel to Scotland. We would travel through the Scottish Western Isles; inside the Isle of Skye and on up to Cape Wrath before sailing across the top of Scotland to Stromness in Orkney. Finally down the East coast of Scotland and England and back along the Channel. A total of nearly 2000 NM. We had 11 weeks: until the last week of July to complete the whole trip. 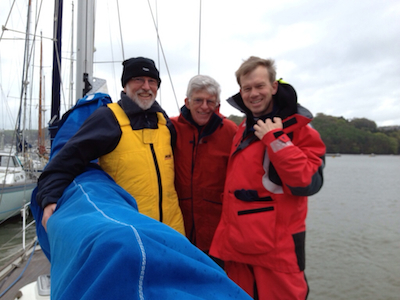 Three of us left from Dartmouth on May 5th; David, Peter George and myself. The journey started with a windy beat to the River Yealm. After this easy first passage, and a good meal in the Ship Inn, the next day we made for Falmouth; we had sunshine and light downwind sailing. There then followed a day off in Falmouth; to buy some of the things we had forgotten. The next day we rounded Lands End bound for Milford Haven, a 133 NM overnight passage; during the night we were accompanied for an hour by a pod of 20 Dolphins, playing in the reflections from our navigation lights. We were stormbound in Milford Haven for two days before making the trip over to Arklow in Ireland. The passage to Ireland took us through both Jack and Ramsey Sounds off the Welsh coast. We had Peter George on board who provided local knowledge for this tricky passage. In Arklow we met another RDYC boat—’Sea Hayes’—she was doing a Round Britain and was going the same way but we did not meet up with them again. The journey continued up the eastern Irish coast to Carlingford Lough and on up to Glenarm in Northern Ireland. The passage across the North Channel to the Mull of Kintyre was accompanied by thick fog. This was made far less stressful using AIS and radar. The fog miraculously cleared when we reached the Scottish coast. Our route would now take us through the Western Isles, by way of the Sound of Jura, taking in Oban and Tobermory. Tobermory, on the island of Mull, is a picture postcard of a place with its multi-coloured houses around the harbour. We only stayed one night before moving on to the Isle of Skye; travelling through the infamous Kyle Rhea, where we were sucked through the narrow sound between the mainland and Skye at over 11 knots. 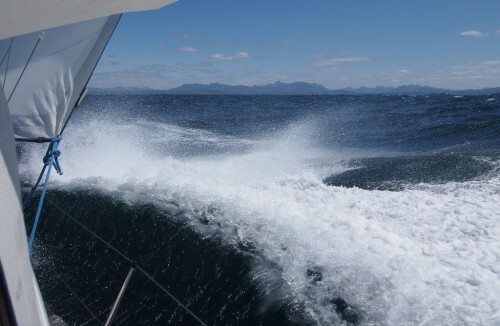 The our route up to Cape Wrath provided some great upwind sailing in fairly strong winds. Some of the best sailing was in the Raasay Sound where we had to beat into F5/6 whilst surrounded by amazing mountain scenery and in glorious sunshine. We had over two weeks of sunshine whilst in the Western Isles. The NE wind limited what we could do though as beating to windward meant that the distances per passage were shorter. We were now making for the jumping off point for rounding Cape Wrath, Kinlochbervie, a small fishing port. A new crew member, Andrew Maunder, had joined us for the 90NM trip across the top of Scotland and to Orkney and stayed with us as far as Peterhead. The weather gods were kind and we made the 90 NM trip to Stromness, again to windward, without problems. A few days rest on Orkney, during which we visited Skara Brae, a 5000 year old large stone-built settlement, located on the Bay of Skaill on the west coast of Mainland, Orkney. It is older than Stonehenge and the Great Pyramids. 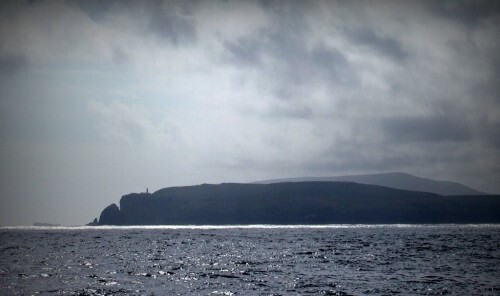 The sail across the Pentland Firth to Wick provided our first downwind sail in over a month. The next day the wind changed again and was back on the nose. It stayed on the nose the whole way back to Dartmouth! One notable gem on the East coast of Scotland is Arbroath. A small and picturesque harbour which is still surrounded by its famous herring smokeries. You buy them off the quay and they tasted as good as we had expected. They keep for three weeks and one made it back to Dartmouth! The further we went down the East coast the more the weather deteriorated; stormbound in Grimsby docks for six days being our low point. The good news being that the beer in the Humber Cruising Association—a really friendly club—was only £1.50 a pint! Then, just as we were in the finally stages of harbour rot, we managed to escape via a 110 NM passage across the wash to Lowestoft. This passage is one of the longer ones with no refuge for fin keelers at all. It was made without incident; other than the large number of ships in narrow channels and much slaloming around the windfarms. The next few days were spent revisiting Dawn Treader’s East Coast cruising ground. Thick fog was our companion as we made our way down past the many East Coast rivers. It cleared and we spent a the night on the River Deben moored at Ramsholt and then next day visited the Tide Mill yacht harbour at Woodbridge. A fully working tide mill is a sight worth seeing, especially in such a picturesque setting. After a brief visit to Woolverstone on the River Orwell—where Dawn Treader used to be berthed—it was time to cross the Thames estuary to Ramsgate and begin the trip back along the Channel. Bad weather provided us with our rest days, as we were battling southwesterly winds the whole way. Another crew member, John Sommers, joined us at Brighton for the final part of the trip. We took in ‘J Class’ yacht racing in the Solent as well as nipping into Weymouth harbour, just ahead of the Olympics, before rounding Portland Bill for the last leg home. 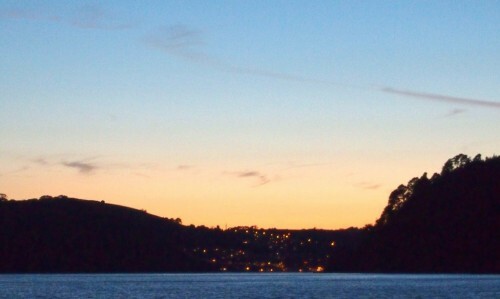 The final passage across Lyme bay produced some real sailing; and after the now familiar beating to windward we closed the Dart entrance in darkness. We were on target for a pint at the Royal Dart Yacht Club to celebrate our finish. Then we heard a yacht near to us calling the coastguard for help. They had lost engine power and the wind had fallen light. It was a classic wooden boat called Rubicon and we dutifully towed her into Dartmouth; the Dartmouth lifeboat team were there to help with lines. We finally arrived back at Noss at 23:00 on July 20th. Some 76 days and 1938 NM after setting off. Round Britain 2012 powered by WordPress and Jenny.